An important chapter in our exploration of the solar system concludes tomorrow, when NASA’s Cassini probe makes its final close flyby of Enceladus, an icy moon orbiting Saturn with a global ocean beneath its surface. Cassini has already collected samples to determine if Enceladus’ seawater might be habitable—but we still have some unfinished business with this tiny Saturnian satellite. On December 19th at 9:49 a.m. PST (12:49 p.m. EST), Cassini will zip within 3,106 miles (4,999 km) of Enceladus’ south polar terrain, where curtains of ocean spray surge into space at a rip-roaring 800 miles per hour, feeding Saturn’s E-ring. It’ll be the 22nd time Cassini has flown by Enceladus since entering Saturn’s orbit in 2004. While it isn’t our closest pass by a long-shot—we sailed within 16 miles of the moon’s surface in 2008, and took another deep dive thorough its south polar plume this past October—tomorrow’s flyby distance was carefully selected to answer a critical question: how much heat is emanating from Enceladus’ ocean? “Measuring the heat from the south pole is a very important constraint on how much heat there is in the interior,” Linda Spilker, Cassini project scientist at NASA’s Jet Propulsion Laboratory, told Gizmodo in a phone interview. And determining how hot the moon’s core is will help astrobiologists figure out whether Enceladus really can support life. A mere 301 miles (484 km) in diameter, Enceladus is a complex, geologically active moon with thick outer ice shell and a rocky core kept warm through the gravitational tug of Saturn and another moon, Dione. Sandwiched between icy crust and rocky interior is a globe-spanning ocean that’s become one of the most interesting places to hunt for life beyond Earth. Best of all, cracks in the moon’s south pole ice sheet are shooting jets of frozen saltwater into space—free samples for any curious space probes who happen to be in the neighborhood. 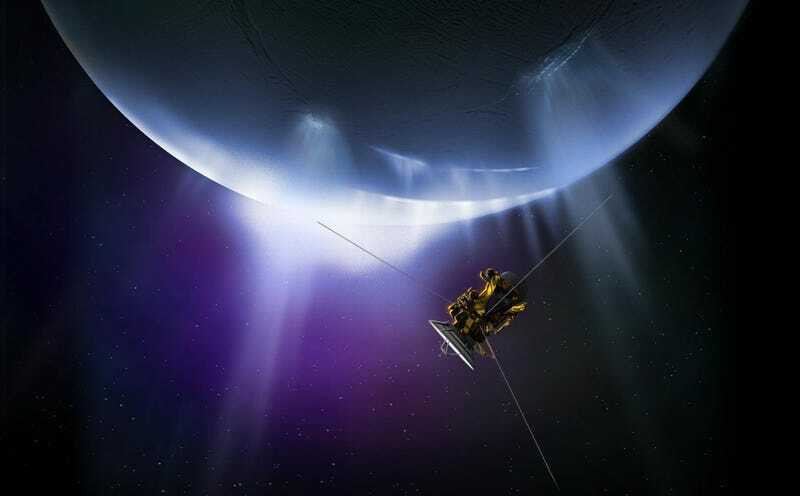 In October, Cassini took a deep plunge through that south pole plume, passing within 30 miles (48 km) of Enceladus’ surface to collect a droplet of alien ocean water. Scientists are hard at work analyzing the October sample’s chemistry, and hope to announce their findings within the coming months. “We’re really looking forward to completing the mass spec analysis of molecular hydrogen,” Spilker said. Molecular hydrogen, or H2, is a simple energy source that feeds microbial communities living in deep sea vents on Earth today, and if we find it on Enceladus, that’d be a big deal. Tomorrow’s flyby will add another piece to the habitability puzzle. Life doesn’t just need a chemical energy source, it needs heat. “We now have evidence of nanosilica grains that could only be generated in very hot water, leading us to discuss hydrothermal vents,” Spilker said. And of all the places to look for hydrothermal activity, the south pole is most promising. For one, it’s currently in the darkness of a years-long Saturnian winter. Without the Sun’s rays striking Enceladus’ surface, scientists will have an easier time detecting heat from the interior. What’s more, recent modeling work indicates that the crust over the south pole is particularly thin. “Maybe that thinner crust means we have a warmer region in the south,” Spilker said. With the data Cassini collects tomorrow, and all the other science it’s accomplished this past year, we can expect to have a much better picture of Enceladus’ habitability prospects in the near future. One way or another, our discoveries about this little ice moon have been an incredible, and unexpected, outcome of Cassini’s decade-long exploration of Saturn’s rings. Who knows—maybe first contact won’t involve an rocky planet in the habitable zone of a sun-like star, but a weird, alien moon, nestled in the shadows of a monstrous gas giant in the frigid reaches of space.